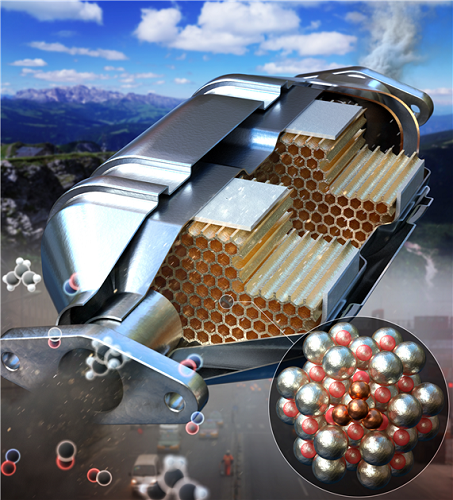 A KAIST research team has developed a fully dispersed Rh ensemble catalyst (ENS) that shows better performance than commercial diesel oxidation catalyst (DOC). This newly developed ENSs could improve low-temperature automobile exhaust treatment. Precious metals have been used for various heterogeneous reactions, but it is crucial to maximize efficiency of catalysts due to their high cost. Single-atom catalysts (SACs) have received much attention because it is possible for all of the metal atoms to be used for reactions, yet they do not show catalytic activity for reactions that require ensemble sites. Meanwhile, hydrocarbons, such as propylene (C3H6) and propane (C3H8) are typical automobile exhaust gas pollutants and must be converted to carbon dioxide (CO2) and water (H2O) before they are released as exhaust. Since the hydrocarbon oxidation reaction proceeds only during carbon-carbon (C-C) or carbon-hydrogen (C-H) bond cleavage, it is essential to secure the metal ensemble site for the catalytic reaction. Therefore, precious metal catalysts with high dispersion and ensemble sites are greatly needed. To solve this issue, Professor Hyunjoo Lee from the Department of Chemical and Biomolecular Engineering and Professor Jeong Woo Han from POSTECH developed an Rh ensemble catalyst with 100% dispersion, and applied it to automobile after-treatment. Having a 100% dispersion means that every metal atom is used for the reaction since it is exposed on the surface. SACs also have 100% dispersion, but the difference is that ENSs have the unique advantage of having an ensemble site with two or more atoms. As a result of the experiment, the ENSs showed excellent catalytic performance in CO, NO, propylene, and propane oxidation at low temperatures. This complements the disadvantage of nanoparticle catalyst (NPs) that perform catalysis poorly at low temperatures due to low metal dispersion, or SACs without hydrocarbon oxidation. In particular, the ENSs have superior low-temperature activity even better than commercial DOC, hence they are expected to be applied to automobile exhaust treatment. This research, led by PhD candidate Hojin Jeong, was published in the Journal of the American Chemical Society on July 5.